1 of 3 Coat large nonstick skillet with nonstick cooking spray. Heat skillet over medium-high heat. Add sausage; cook, breaking up with wooden spoon, 5 minutes. Add garlic; cook until sausage is no longer pink, about 2 minutes. Stir in tomato sauce, cherry tomatoes, basil, salt and pepper; cook until slightly thickened and tomatoes have collapsed slightly, about 8 minutes. 2 of 3 Meanwhile, cook spaghetti in large pot of lightly salted boiling water until al dente, firm yet tender. Drain. 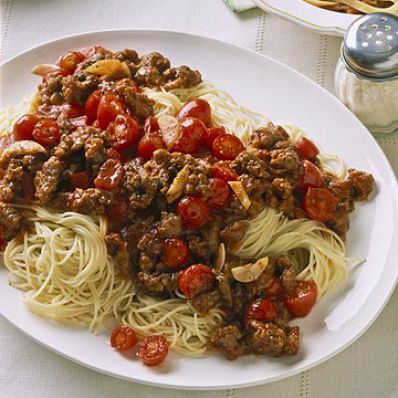 3 of 3 Transfer spaghetti to large bowl or platter. Pour sauce over top of spaghetti. Serve immediately, sprinkled with cheese, if desired. Makes 6 servings. Per Serving: 54 g carb., 9 g sat. fat, 59 mg chol., 26 g Fat, total, 1442 mg sodium, 5 g fiber, 21 g pro., 533 kcal cal.